This is like 7th place I post this in. I have read every single google link with related keywords. No answer. At this point im exhausted, and have'nt even tasted RC hobby yet. So two weeks ago I received my QX7 Taranis. I had also ordered a XSR-E receiver for it. As soon as I got my taranis, I updated open tx to the newest one and also did the same for the internal XJT module. All cool. Then I wanted to flash EU firmware for the receiver. In both cases I got the error : "bottom pin no resp"
I have tried everything and read everything I could.. Nobody really seems to help me out with this, As I also dont have any friends that are in this hobby. Pretty much im bummed out, as I dont know what to do. Does anyone have ANY idea what could be the cause or how to solve it? Can I fire up the receiver with a 5v battery or something just to see if it even works? I wouldnt want to solder it on the FC, cause I havent yet tested everything for shorts etc.. So that would be a bit sketchy. Hi, using the SPort of the Q7 you should not switch the connections. Had the same issues and search a lot. Finaly i found a page where it was described. Using the Sport it only works if you don't switch the cables. I had to switch them As I had made the cable to use for the bay. Wires are in the correct order. 1000%. Ive checked it like gazillion times now. There is a post and picture of the QX7 bottom port. The order from left to right is gnd, + and signal. That is how i did with an XM and an XSR receiver and it works. Yes. I saw this thread. And if you opened the pic, you saw that I have wired it exactly like that. Error still is present. Did you check the continuity of the cable you're using? I have a X9D+ so I'm not familiar with the QX7, nor flashing with the TX, but I have flashed using a USB/FTDI interface and the FrSky flashing of the RX's is a bit finicky. I remember I had to hit the flash command / button at the right time, very quickly as soon as I applied power / connected the device up. Not sure if it's the same with your method, but did you give it a bunch of tries? You may need to very rapidly connect then command it to flash. I think there might be a small window in the boot loader sequence when the RX is waiting to flash new firmware vs finish booting up the firmware. Yeah , I also decided to check continuity of the cable just a few minutes ago. Everything is fine.. this is driving me nuts.. Then I decided to check if even it powers up when the power is applied. So I took 4 AA batteries , connected them in series. Measured that it outputs 5.14 volts. Applied that to the RX and nothing happens. There should be LED blinking if im not mistaking. It seems its dead? That would also explain why "bottom pin no resp". Even though it makes no sense. I could swear for my arm, that It couldnt be shorted out.. as I really checked the wires way to many times than needed, before connecting anything to anything. I also checked the continuity when the cable is in. It indeed provides 5.14 volts to the pins and nothing happens. If the LED's don't light up at all when power is applied, chances are it's dead. Damn it. What could be the cause? Cause I bet I didnt short it out. OH well.. There goes countless hours of wondering if the Taranis is faulty. if the power and ground feed is ever reversed, that's one possible way to kill a RX. Another might be by feeding power over 5-6V, sending it to the signal lines (which I believe can only handle up to 3V... but I may be wrong) or even just static discharge could all kill an RX. Of course, it could have been DOA from a bad component or faulty manufacturing. When you first applied power, even for flashing, did any LED light up? I believe all my RX's light up their LED status lights even when just flashing. No, nothing light up at any point of the process. Static charge.. damn it. I have just one receiver and just one transmitter.. how do I tell which one of them is acting up. My entry to this hobby has been pretty painful so far. One guy is trying to tell me theres no way the rx is bad. I just thought of measuring if there is any voltage at the SPORT to see if its even working. As soon as I hit flash ext. device it outputs 5 volts and within a second disappears as the error shows up that there is no response from the bottom pin. I guess thats the signal wire not getting the signal? I guess indeed its a bad rx? EDIT2: Okay now I messed up for sure. There isnt 5 volt coming from signal. I measured it from middle pin and signal.. not signal and ground. I think tht your receiver is fried. If you apply 5 Volt to the receiver, it should a led light up. If nothing happens your RX is dead. 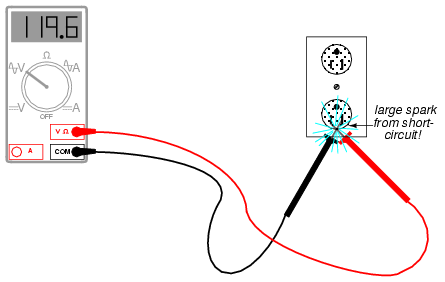 I'm afraid that just by connecting the 5v (middle pin) to the signal line (light colored wire) even with just a multi meter in voltage test mode is enough to fry any of the electronics in the rx if you send any power down the 5v (red) wire. Need to be very careful in the future about not doing precisely that. You normally never have to measure the signal line. It's designed to only send a signal that you can really only measure with an oscilloscope (or a servo). Sorry to hear of your frustrations, but I'm surprised you started with trying to change all the software first. My advice to another fellow I helped get started in the hobby was to make sure everything first worked together. If it didn't, then start troubleshooting. Upgrade only if you know what you are doing and that can only come from having gained the experience. Unfortunately, it is a hard lesson to learn, but you have now gone down that road so things hopefully will go better from here on out. And as for the software. I was just watching Project Blue Falcon where he suggested installing the newest open tx when starting. Thats why I did that. You may have already seen this and done the steps. Using a multimeter in the volts setting won't kill the electronics. Buy a couple of receivers when you first start. As you gain confidence and experience start buying only what you need. If you are in N America buy from Aloft Hobbies for after sales support. You appear to have done all the usual trouble shooting steps and more. Gotcha! Thanks guys for the help! The only place where someone actually helped with this problem. And I gotta say its a relief to know that 99.9% its the RX thats acting up, not the Taranis. I believe nothing would happen then either It would just show 0 volts, as there is no difference in the potential. Buuuut Im no electrician. It depends on how you connect the test leads to the RX. If you are manually holding/touching the test leads to the exposed header pins, and most header pins for JR connectors are about 2.5mm apart, it's easy (at least for my unsteady hands) to slip and have either the probes touch each other or one probe touch both pins, creating a short between the 5V and signal pins.